Initially, we welcomed the Government's intention to amend the Constitution. However, when the blue Bill was tabled in Dewan Rakyat, we realised that it was only politics and not really to “give” what Sarawak and Sabah had wanted. From there, we, the GPS MPs, then split our roles. Dato' Sri Haji Fadillah and Dato’ Sri Nancy had two engagements with the De Facto Law Minister, Datuk Vickie Liew to amend the Bill while I prepared for the referral of the Bill to the Select Committee. 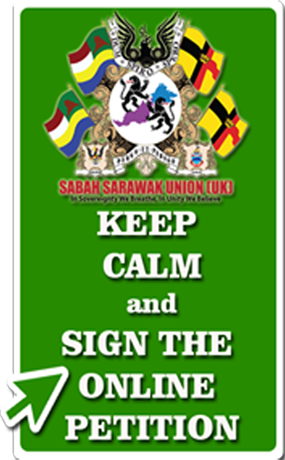 We had several consultations with our lawyers at the Sarawak Attorney Chambers for the draft of the amendment. The GPS MPs continued our internal discussions and division of work. Dato' Sri Tiong and Dato' Sri Fadillah went to engage our MP friends to explain our position and stand. 1. 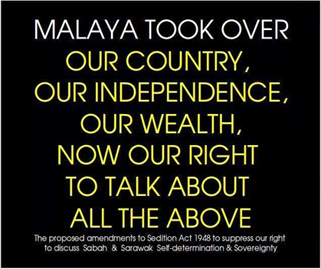 To withdraw the Bill and to study the Constitution for a greater amendment on some of the inconsistencies in the Constitution; for example, the interpretation of “Federation” in Article 160(2) which refers to the Federation established under the Federation of Malaya Agreement. 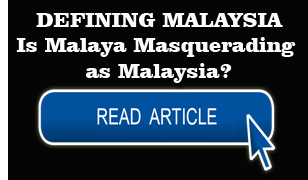 Therefore, to our considered opinion, the hundred of Federation appeared in the Federal Constitution is about the States in Malaya. 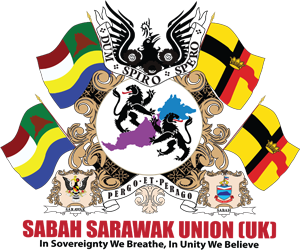 While Sarawak and Sabah are NOT part of the Federation of Malaysia! 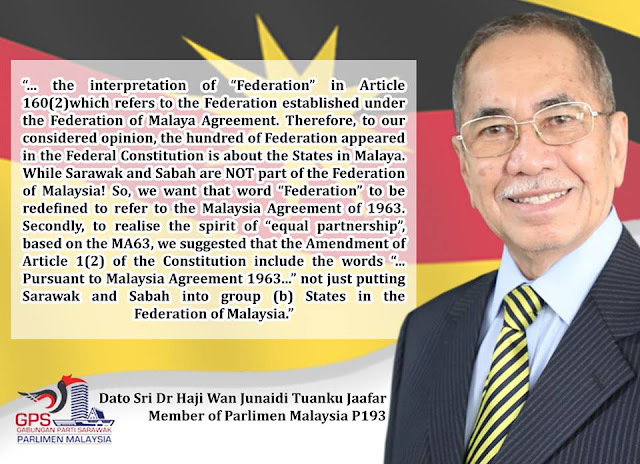 So, we want that word “Federation” to be redefined to refer to the Malaysia Agreement of 1963. 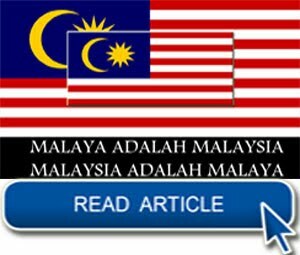 Secondly, to realise the spirit of “equal partnership”, based on the MA63, we suggested that the Amendment of Article 1(2) of the Constitution include the words “... Pursuant to Malaysia Agreement 1963...” not just putting Sarawak and Sabah into group (b) States in the Federation of Malaysia. So all of the GPS MPs agreed that the amendment was not well considered and that the opinion of Sarawak and Sabah were never consulted and considered. 2. Then on 9 April 2019, after Dato' Sri Fadillah and my discussions with the Minister of Law, the minister expressed his reservation on the inclusion of MA63 in the Article 1(2) amendment which we proposed, but he wanted to consult the Federal Attorney General and get the consent of the Prime Minister. By 2.15 pm, the Government's new amendment Bill was distributed on the tables of MPs in the Dewan. This time purportedly to reinstate to the previous wording of Article 1(2) to pre-1976. 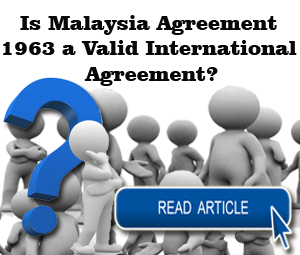 Still, there is no reference to the Malaysia Agreement of 1963. From this, we could see that they do not want the spirit of MA63 to be in the Constitution. And again, we discussed among ourselves on our stand. I said, “We all agree to stand, advised by Kuching and the Chief Minister on our next course of action”. We maintained this stand to the end, and advised our colleagues in Barisan Nasional, PAS and the Sabah MPs who are not in PH government. 3. All the strategy in the Dewan was given to me, and all the GPS MPs were advised to see my action and reaction. We discussed among ourselves with Dato' Sri Fadillah, Dato' Sri Tiong and the others, as we continuously discuss on our stand and action. 4. Our stand to refer the Bill to the Special Select Committee of Parliament continued. I was to table the motion after the Second Reading. From the explanation made by the PM who tabled the Bill, and the amendment Bill. His explanation on Article 160(2) was really mind-boggling - it seems there are “two” meanings to the word Federation in the Federal Constitution. 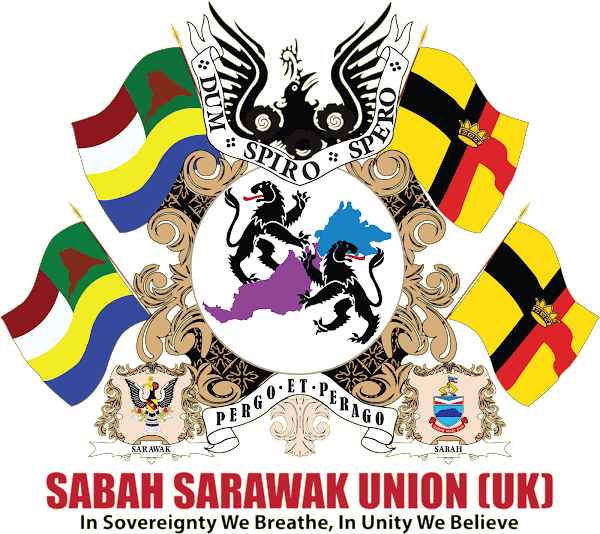 One refers to the Federation of Malaya established under Agreement 1957, and indeed there is another for the Federation of Malaya, Sarawak and Sabah. However, there is no explanation when either one is to be used. 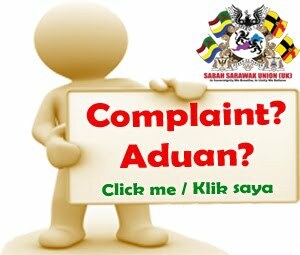 The answers to the questions posed by the Opposition Leader - Dato' Sri Ismail Sabri of Barisan Nasional on this interpretation during the winding up was far from satisfactory. 5. I stood up under Rule 54(2) of the Rules of Dewan Rakyat for the Bill to be referred to the Special Select Committee of Parliament after the winding up. We lost on the “Division” but sent a strong message that we GPS MPs could not be part of another mistake in Dewan Rakyat. 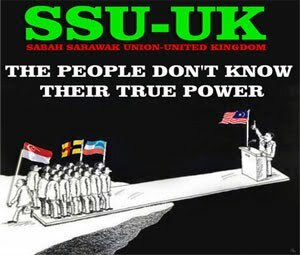 The failure of the government to treat the importance of Malaysia Agreement 1963 to Sarawakian and the need to put the establishment of the Federation of Malaysia is by the Agreement of 1963 and not the Malayan Agreement of 1957. 5. It was the fault of the Federal Government not to appreciate the importance of MA63 to us Sarawakian and to put the Agreement in the Federal Constitution to reflect its significance. We intend to amend Article 1(2) and to put the spirit of MA63 for posterity in the most important document in the country - the Federal Constitution. The PH government lost that opportunity in making their first step which we in GPS believe should be the first right step, not the first wrong step again. 6. That was why we did not oppose the voting in the Dewan because there was a good intention to amend; albeit wrong, so we GPS MPs decided to abstain from making a similar mistake yet again.